A brand-new airbus has taken off at 12:00 am from Hong Kong International Airport, then landed at the parking apron in Zhangjiajie Lotus International Airport just on time through a 2-hour flight on 18th, October. It announces a new regular air route has opened between Hong Kong and Zhangjiajie. The service is offered by Hong Kong low-cost carrier HK Express using an A320 aircraft with a total capacity of 180 seats. There will be two flights a week. 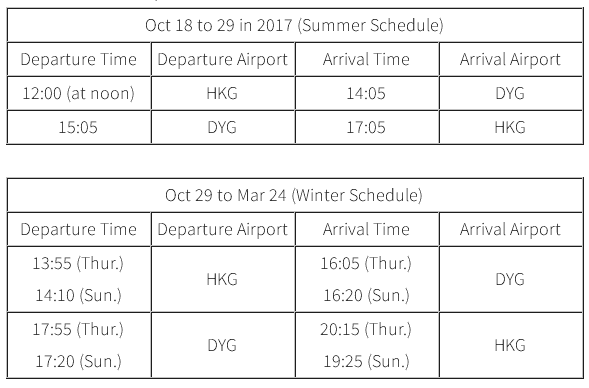 The flight is available on Wednesdays and Saturdays from Oct 18 to 29(It is expected to be Mar 25 to Oct 29 next year); during winter time as between Oct 29 to Mar 24, it is available on Thursdays and Sundays. Here’s a timetable for the departure and arrival times.